Metering and dispensing machine available for use with Polyester/Vinylester or Epoxy resin and hardener systems. Material can be recirculated up to these valves, and then back to the material containers to allow efficient priming without material wastage. Mixing head with auto-recirculation valves. Flush system to clean mixing head after dispensing operation or after pre-determined time interval (user adjustable). Static mixer in protective steel shroud. Mix head is mounted above dispense platform as standard but this can be adjusted to suit the individual application. Fixed dispensing valve for mixed resin and hardener. Valve allows mix-head to be completely flushed-through the valve and into a waste container via a fixed waste pipe. Allows mix head to be safely flushed without needing to place an open waste container onto the dispense platform. Pre-settable volume/pump counter with auto-stop. 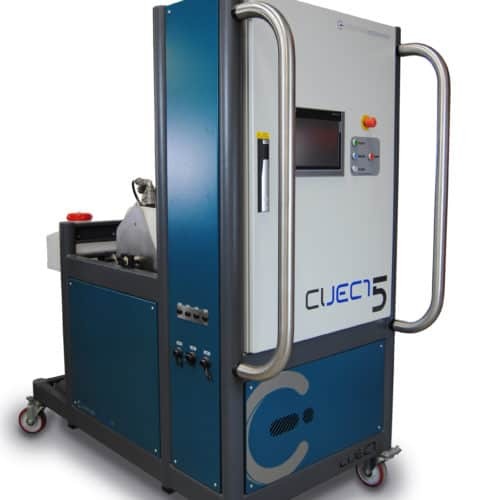 Kits available to convert machines to process alternative resin types– specification and prices on request. e.g. XE-0001-01-07 specifies a Ciject Zero dispensing machine Polyester version with a ‘Plus’ option.